chocolate peanut and pretzel brittle | smitten kitchen. What’s the Right Way To Make A Hot Toddy? | Mental Floss. Cocktail Party Gingerbread Folk | Sprinkle Bakes. They include little foil wrapped booze filled chocolate bottles, what a splendid idea. See also: Gift This! Santa’s Candy Bark. Brunch Cocktails- Cranberry Ramos Gin Fizz – Craft and Cocktails. Via Design Crush. SANDY OLD MAN ON X’MAS | Lady and Pups – an angry food blog. eggnog waffles + a few favorite kitchen things | smitten kitchen. I’m bookmarking this for #4: a deeply dark Dutched cocoa that has an Oreo taste. Interesting! The Best Cut-Out Sugar Cookies Recipe | The Kitchn. See also: Roll Out Sugar Cookie Dough Before Chilling It. Everything Bagel Bombs, at the Amateur Gourmet. I used Adam’s instructions for Momofuku’s bagel bombs last year and it became an instant tradition. You can freeze these before baking and put them into the oven right from the freezer, perfect for a low fuss fancy breakfast option when the focus is on opening presents. How to: Hanging Twig Christmas Tree » Curbly. NORAD’s Santa Tracker Began With A Typo And A Good Sport : NPR. This is an amazing story. Here are some mobile/tablet games that I recommend for keeping you distracted during long stretches of travel or just during the dark winter nights. (I played all of these on iOS but I’ve linked to the developers websites for each game and noted what platforms they are available on.) They aren’t new but these are the ones that I found memorable and keep around for replaying in the future. At the bottom of this post is a list of little puzzle games that keep me happily distracted while waiting in lines at the airport. Happy travels everybody! I am very, very obsessed with this game. This is a cute and stylish puzzle game that hits all the right spots – the controls are easy to pick up, there aren’t any Running Against The Clock levels, there is a rewind button that will take you back one step at a time, and the puzzles are just difficult enough to make you feel like a GENIUS when you solve them but never quite get frustrating. There are plenty of elements to make completionists happy including some play-it-again challenges that make early levels that much more challenging. In Tetrobo and Co. you pilot a tiny robot through each level moving and arranging blocks to make your way to the exit. The blocks have different properties (magnetic, reflective, impervious to fire, stick to the walls). These are all very familiar game concepts but the levels here are especially clever, often requiring a bit of extra discovery on your part to solve. As you go along new physics are introduced so the puzzles never get repetitive. I found the clicky/whirry/buzzy sounds in this game particularly appealing and the soundtrack changes for each set of levels. There is a sweet little background story that is revealed as you solve things that is safe to ignore if that’s not your thing, it’s a continuation of story behind Swing Swing Submarine’s previous game, Blocks That Matter. What else? The main protagonist in this game, the one who built the tiny robot, is a girl. The game is completely safe for kids (but please don’t tell me if your seven year old found the whole game really easy, my ego will be crushed). It was originally built for PC and is available on Steam, but it was clearly designed with touch screen in mind. I’ve played the predecessor to this game, Blocks That Matter, on my laptop and found the levels just as clever but occasionally more dependent on frustrating time elements (for example, a series of crates catching on fire, a constantly oncoming boss monster). I was able to get through all of the main levels without rage quitting and can definitely recommend playing it. 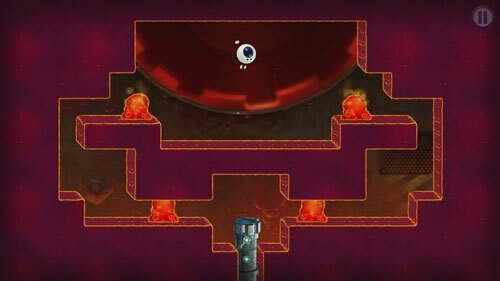 I’ve been trying to describe to friends why I like Tetrobot and Co so much and I’ve been comparing it to the Portal games because of how smart it makes me feel when I solve a level. I’m currently giving this game a rest in the hopes that I forget all the tricks and solutions so I can play it all over again. Save for kids? Yes. App Store/Steam/Google Play/Humble Store/GOG. Reviewers compare this to a Zelda game (Wind Walker era) and they aren’t wrong. In this game you play a young boy who explores islands, swings a sword, shoots arrows at monsters, finds hidden caves and, yes, defeats a few boss monsters all in the effort to save the world and find his long lost father. I’m not partial to console-like games on the iPad but this one won me over in a big way and I’ve played all the way through it twice. The monsters that you encounter as you explore the world aren’t difficult to defeat (though they do respawn the moment you leave each area) and I had less trouble with the boss monsters than I feared (with a little help from some walkthroughs, I admit, because ugh boss monsters ugh). 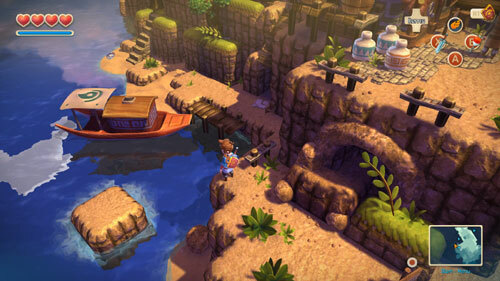 While you do encounter plenty of monsters the game is well balanced with lots of time for exploration on each new island, and a few towns where you can stock up. There are lots of hidden areas, completionist elements and reasons to revisit old areas (like magic boots that allow you to cross gaps). Despite the usual meters for health/money/arrows/bombs I never found myself stuck. There has been a nice update to the game this year so I’m ready to play through it again. Safe for kids? Yes. App Store/Steam/GOG/Humble Store. Disclosure: I played this on PC because I was a Kickstarter backer and that was the option available. Having played it and carefully scoured reviews for the touch screen version of the game I’m pretty sure that you won’t miss having a mouse and keyboard when playing this game. 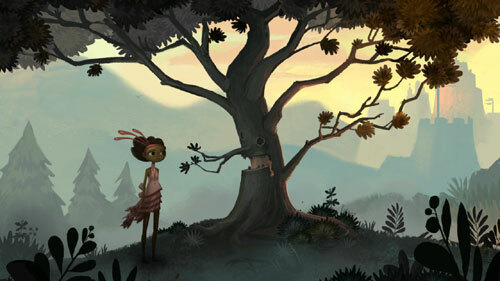 Broken Age is a brand new retro style point and click adventure game of the sort I grew up playing. It’s more about the story and a bit less about the puzzles and I absolutely loved it. The graphics looks like watercolors, the characters are all voiced incredibly well (and by lots of names you’ll recognize) and I absolutely fell in love with all the characters. There is humor and heart and randomness and a little bit of “I have a bucket, a skirt and a mirror and I need to convince a sentient vine to let me jump into the pit” that you’ll recognize if you’ve played these sorts of games before. The world of the game is split between two characters/worlds that you can switch between if you are feeling stuck with one storyline or the other and I bet you’ve already guessed that at some point the storylines cross. For as much as I love the world that Doublefine has created and I love this sort of game, there isn’t a lot of puzzling or defeating going on here and after a while it becomes clear that no matter how many amusing conversation threads there are you’ll eventually be lead towards the only one that counts. This didn’t make me love the game any less, but if you’re not a fan of the King’s Quest era games this isn’t one that will change your mind. Safe for kids? Yes. App Store/Steam/PS4/PS Vita/Google Play. Everything about this game seems geared towards a younger version of me but it managed to completely delight my old self. It’s a little bit cartoonish and it’s interspersed with the style of logic puzzles that I remember being given to pass the time during long car trips. (Kids, this was before we had iPads or even, shudder, portable DVD players. Car trips were boring, grim and probably account for 95% of my lateral thinking ability.) The real star here is the narrator who manages a humorously dramatic tone and does all the character voices. Half of the game are the aforementioned logic puzzles and half is listening intently to the answers that possible suspects give which I found surprisingly tricky since my brain is so likely to tune out at the wrong moments. This whodunnit/logic puzzle combination is something I’ve seen in a few games but it’s executed perfectly here and I recall the story as fondly as the puzzles. Safe for kids? Yes. Except, you know, it’s about murder. Kid safe? Yes, but murder is a thing. App Store/PS3/Steam/Kindle Fire/Google Chrome. 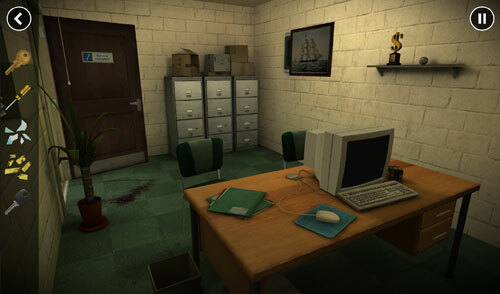 This is a murder scene investigation game with controls similar to The Room. You can move around, zoom in, make observations and collect clues, find codes and open drawers and uncover some hidden areas. At the end of each case you answer a series of questions and uncover the guilty party. Safe for kids? No, there are some dead bodies lying around. Not gruesome but definitely grim. App Store/Google Play/Kindle Fire. 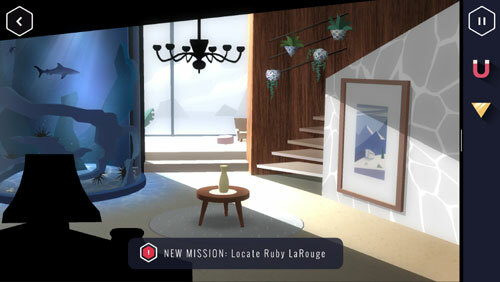 A stylish point and click adventure where you play a secret agent who needs to work her way through the hideout of a villain, Ruby LaRouge. 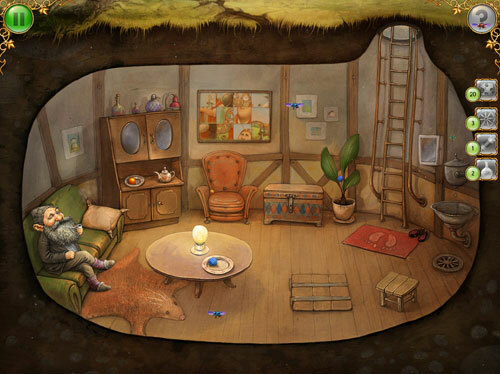 The game is full of tropes – keys and locks and passcodes, hidden panels, getting a clue out of a fish tank that contains sharks, trying to get the cat to move. The game play felt slow at times (go all the way outside to get that thing, now come all the way back, now go outside again) but the puzzles and storyline kept me entertained the whole way through. Bonus points for both the secret agent and the villain being female. Safe for kids: yes but violence is implied. App Store only. I’ve been a little hesitant to recommend this game here. The game has beautiful Samorset-like hand drawn visuals, a relaxing soundtrack, and a charming story. 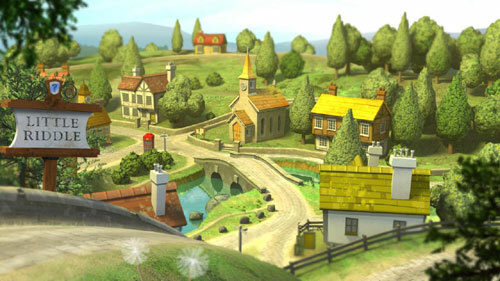 The elements of the gameplay involve hidden object hunting, logic puzzles, jigsaw assembly, some Simon Says (ugh), a couple of constantly moving 8-bit style mini games (which I find frustrating and overly long) and a few puzzles that just require that you put the things in the right place that are somehow simple and difficult at the same time. I don’t find any of these elements particularly swoon worthy on their own but they’ve all been brought together into a game that is (most of the time) relaxing despite all my protestations. Kid friendly? Yes. App Store/Steam/Google Play. These are easy to learn, quick to play games that are perfect for when you need something you can pick up and put down just to fill the time spent waiting in a long line. Or, you know, while on your couch watching reruns of Scandal. Games I’ve got to carve some time for but love so far: The Wolf Among Us, Seek (swivel chair is helpful, go try it out), Lifeline, Walking Mars, Heroki and The Room 3. What have you been playing? Let us know if you have any gems! 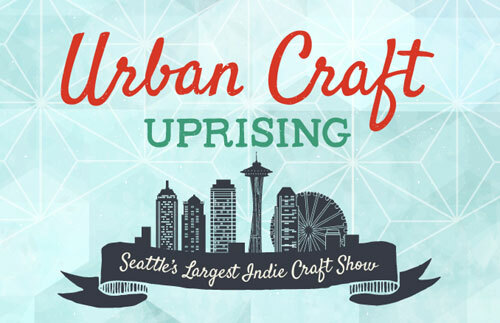 There are lots of chances to buy delightful handmade gifts in and around the Seattle area this December but there are three going on this weekend that are of particular interest to me, and maybe you. These events are run by or feature people who I have worked with and dearly love because they make Seattle a more amazing city. 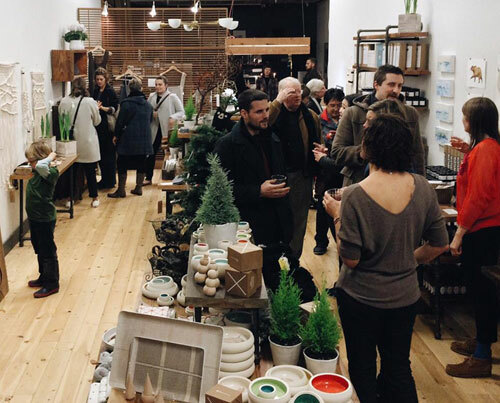 Dec. 3rd – 5th, 11am to 7pm, 666 King St. “A 4-day gift-centric pop-up shop featuring the handcrafted work of PNW makers.” Lovely curated collection filled with things to eat, bake with, wear and display. Open every day through Dec. 31st, in Pacific Place Mall. Ok, so this one isn’t exclusive to this weekend but check it out while you’re downtown (and before they go back to a weekend only schedule). 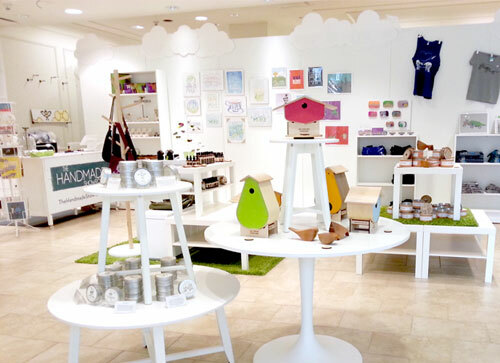 The shop features goods from artists and makers in the Pacific Northwest (Washington, Oregon and Idaho).